Apple on Friday announced a new "Apple Music Live" series of concerts, beginning with a program at the company's Piazza Liberty store in Milan, Italy. 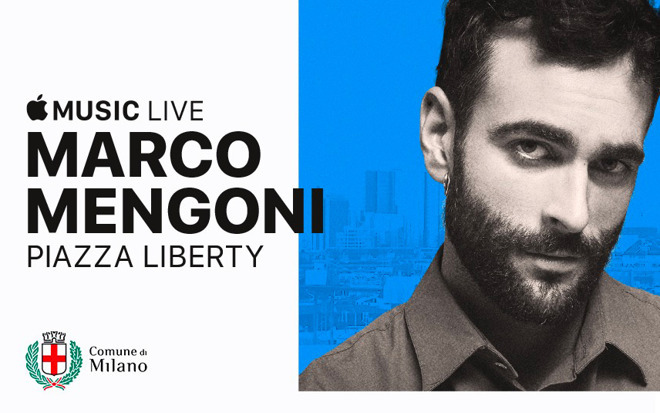 The first Piazza concert will take place March 28 at 8 p.m. local time, headlined by Marco Mengoni. The event is free, but audience members must still sign up for tickets ahead of time. More concerts are planned in the coming months, according to Rolling Stone. These will conclude in October with a performance by famous Italian pianist Ludovico Einaudi. Apple is also holding related Today at Apple sessions at the store, beginning with a Design Lab hosted by Mengoni on Apr. 4 at 6:30 p.m.
To the surprise of some, the company's annual London-based Apple Music Festival was canceled in 2017. The company subsequently switched to smaller-scale events, often focused on individual artists. Last fall for example it hosted a Christine and the Queens concert in Paris, which it used to mark the launch of a new album and making-of documentary.